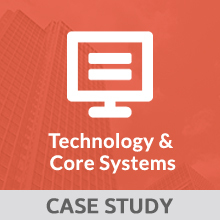 An insurer wanted an application that would allow its accounting department to automatically generate invoices from policy information, perform cash applications for premium payments received, initiate collection processes when needed, and update appropriate bank information. We assembled a collaborative team that included members of the insurer’s staff along with experts from our technology, development, and QA teams. Using the Agile methodology, we outlined a detailed four-month timeline in which to complete the project. We developed the application on the Microsoft .NET platform, using ASP.NET, C#, MVC with AngularLS, and SQL Server 2012 as the databases. Driven by our insurance domain expertise, our application supported both the functional business needs of the organization as well as the existing applications with which the new one would interface. We also shared our extensive knowledge of banking and invoicing procedures with the insurer’s staff.